In a powerful crescendo of accomplishment over the past several years, contemporary classical vocal group Veritas found themselves in some tremendous places, from belting out their signature power harmonies on the Carnegie Hall stage to crooning cruisers in the middle of the Caribbean, to joining Sandi Patty on her Forever Grateful tour. They also found themselves interacting with thousands of fans after shows and online, hearing their stories, their challenges, and most of all, their hopes. This, in turn, energized Veritas’ purpose. With their sophomore record, Hope Survives, the men of Veritas-Jeff Anderson, James Berrian, Andrew Goodwin, Jordan Johnson and Lucas Scott Lawrence-are wielding their powerful, dramatic musical arsenal to communicate the hope expressed by their fans, as well as the hope which guides each of their lives. The power of hope is also something very real and personal to each member of Veritas. For his part, Anderson said he had lost hope in 2007, when he lost his father to a “horrific and painful battle with brain cancer,” and at the same time, lost his voice for 8 months-an ailment that required reconstructive surgery and therapy to learn how to speak all over again. the family when he was very young, embracing hope for the future from his Heavenly Father’s love-something that has become all the more important now that he himself has children. As the only unmarried member of the group, he says that while he can sometimes relate to feelings of emptiness or uncertainty, God fills him with hope that He has a good plan for his life. For Lawrence, hope has emerged in the midst of a heartbreaking journey of infertility he and his wife have experienced. He said the Ronnie Freeman-penned song, “Come To The River”-which he describes as “a breath” on the album-has meant a lot to him, as it is an invitation to rest in the river of peace that Christ offers, especially when it is much easier to dwell on life’s stresses and unknowns. Lawrence and his wife are now resting in that peace as they prepare to meet the child they are going to adopt. speak to the hardships of the human experience by declaring the ultimate victory Jesus brings. 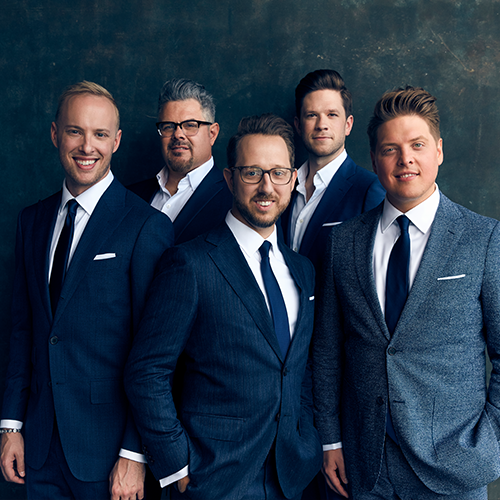 “We wanted to find songs that really ministered to us first, because we knew if they spoke to us-if they really ministered to us first-we knew it would be something we would be able to truly share from the heart,” Goodwin said. Songs from two iconic artists serve as the foundation for the hope that is proclaimed throughout the album, with Veritas’ rich cover of Sandi Patty’s “Via Dolorosa” and their soothing rendition of Bob Dylan’s “To Make You Feel My Love” painting a vivid picture of Jesus’ love for the world. An a cappella treatment of “Great Is Thy Faithfulness” and an orchestral arrangement of “Amazing Grace” give fresh musical paint to time-honored hymns, while “Bring Him Home” from the hit musical Les Miserables declares trust in God in the midst of suffocating uncertainty. In some cases, finding the perfect song meant, for the first time, writing it themselves. “More Than Conquerors,” written by Berrian and the album’s producer, Jay Rouse, invokes Romans 8 with operatic flair and passion. Since coming together in 2012, Veritas has always focused on crafting a dramatic experience to tell the greatest story ever told-the diving drama of love between the Creator and His Creation. Now, they are doing it in a way that more intentionally seeks to speak to their audience. “Once you show people who you are and you are transparent with them, all of the sudden they come out of the woodwork saying, ‘That is my story, too. '” Goodwin said. “The truth is, the five of us on stage represent everybody who we’re singing to, every night.” That’s humbling, they say, but it’s motivating, too. And it has changed them. Whereas Veritas’ debut album introduced the quintet to the world as a musical force, the group’s follow-up uses that musical force to send a message.